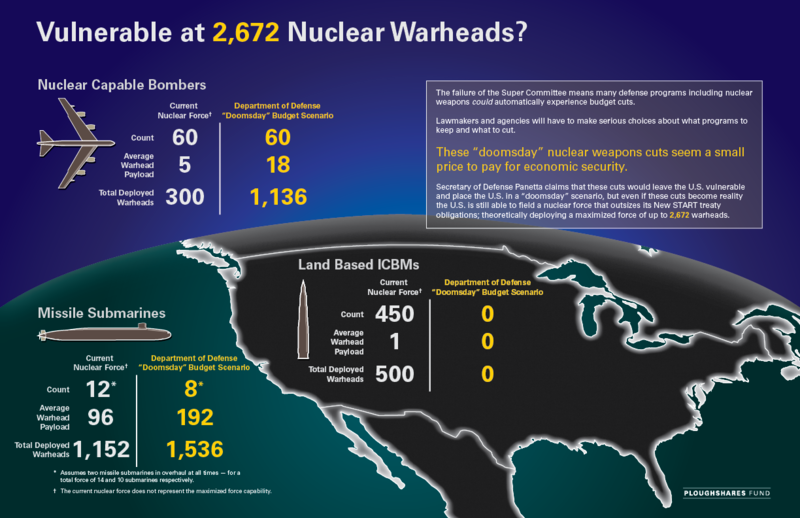 Vulnerable at 2,672 Nuclear Warheads? In a recent article, Jeffrey Lewis of Arms Control Wonk outlined what could happen to U.S. nuclear forces under a sequestration budget. He illustrates that even with Secretary of Defense Leon Panetta’s so-called “doomsday” cuts to nuclear weapons related activities, the U.S. could still field enough warheads to greatly surpass the limits put in place by New START. 12/06/11 UPDATE: A reader correctly noted that sequestration cuts in total dollars did not match Jeffery Lewis' article. I have updated the number on the graphic and in the posting to correct for the error. Thank you for reading both this posting and Jeff's excellent piece. 12/06/11 UPDATE: To avoid any confusion, we have removed the total dollar figure from the post.